A recent move in neuroscience has been to link thinking about the future with episodic memory (autobiographical memory of past experiences). I am grateful to Brian Boyd for drawing my attention to the work of Dan Schacter, Donna Addis, and Randy Buckner (e.g. 2007), who have found that people who have episodic memories that are detailed and specific in terms of time and place tend also to make predictions of possible future events that are detailed and specific in the same way. When cued by particular words, patients with neurological problems, and patients with schizophrenia, were less good at giving detailed and specific information about past events and were also less good at imagining future events in detail. Of course, when imagining the future, things do not necessarily turn out as expected, but the point is that imagination, which the authors discuss in terms of simulation, seems to involve drawing flexibly on remembered events, and how they have worked, and when, and why. According to this idea thoughts of past and future events are proposed to draw on similar information stored in episodic memory and rely on similar underlying processes, and episodic memory is proposed to support the construction of future events by extracting and recombining stored information into a simulation of a novel event (pp. 659-650). In neuro-imaging studies, common parts of the brain are involved in predicting future events and in episodic memory. For instance, Karl Szpunar, Jason Watson, and Kathleen McDermott (2007) have found in an fMRI study that one set of regions (e.g. in the left lateral premotor cortex) was more active while envisioning the future than while recollecting the past, but more active in both these conditions than when thinking about someone else. They found that a second set of regions that included both sides of posterior cingulate, parts of the hippocampus, and the left occipital cortex, were equally active in future envisioning and past remembering. Differences between tasks based on the future and the past.seemed to be due to different demands on motor imagery of bodily movements. Schacter and his colleagues propose what they call a core brain system that is responsible for prospective thinking. 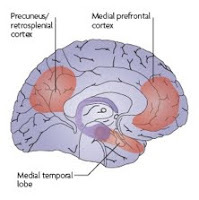 It includes medial prefrontal regions, posterior regions in the medial and lateral parietal cortex, the lateral temporal cortex, and the medial temporal lobe. They suggest that this system is the basis of the integration of information about relationships and associations from past experiences, in the construction of mental simulations. The system is also involved in theory-of-mind. In their article, the authors don’t write about the relevance of this system for fiction, but from their argument this same core system would be central to both writing fiction and reading or viewing it. Daniel Schacter, Donna Addis, & Randy Buckner (2007). Remembering the past to imagine the future: The prospective brain. Nature Reviews: Neuroscience, 8, 657-661. Karl Szpunar, Jason Watson, & Kathleen McDermott (2007). Neural substrates of envisioning the future. Proceedings of the National Academy of Sciences of the USA, 104, 642-647. The connection between recalling past events and imagining the future is interesting here. In both cases, we are creating simulations. Reading fiction, then, increases our ability to do both.